The Internet is awash with self-help health websites. Many of them are very useful, while others should be labelled with a health warning! But the Internet is often a first port of call for many of us when searching for information. However, when it comes to our health, it's simply not worth taking a risk from dubious online sources. If you’re concerned about your health or just want to know how you can go about improving your lifestyle, you can find a wealth of information from patient.co.uk. 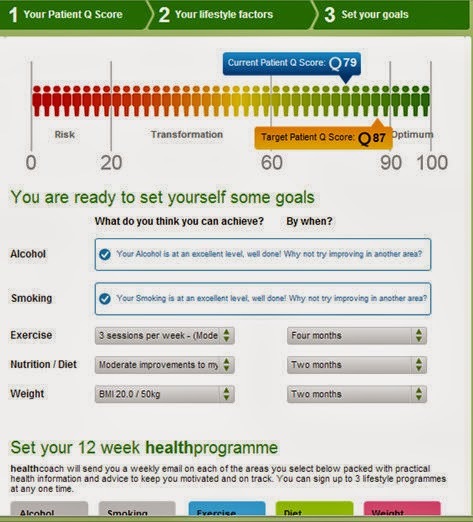 Recently, patient.co.uk re-launched their clinically proven MyHealth tool. This helps to visualise your health and the impact your lifestyle is having on it – both good and bad. I was invited to try out the health tool for myself and I can’t recommend it highly enough. 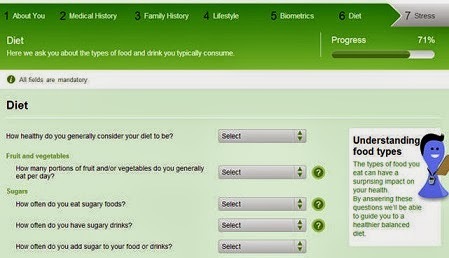 The MyHealth tool works by you answering a series of questions around your health and lifestyle. 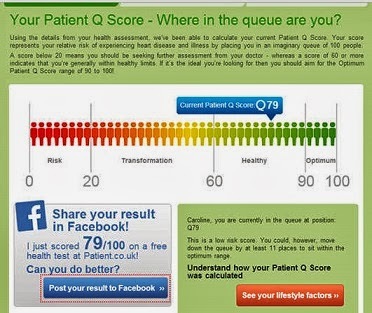 It uses this information to put you in an imaginary queue of 100 people, and your place in this queue helps to visualise the quality of your health, with the 100th person being at optimum health and the 1st in the queue being at risk. Not only that, it then assigns you a virtual health coach, who tailors personalised goals to help you improve your score which you can then use to track progress so you have more control than ever over your health and wellbeing. So this isn’t just a one off test, this is something that has the ability to make a real difference. In order to take the test, you first need to register. This doesn’t cost anything and takes only a moment. Then you are presented with the questionnaire which guides you through seven steps and takes around 10 minutes. Stress. Here you provide answers concerning your feelings and thoughts, general behaviour, sleep patterns and recently experienced pressures. After each stage you are reminded to carefully check your answers as one wrong answer could end up skewing your final score. Once you’ve filled out all the questions, MyHealth does a speedy calculation and invites you to click on the red button to see your Patient Q Score. This brings up a little graphic of a row of people ranging from red on the left to green on the right. Your Q score is positioned somewhere in the queue along this row of people. 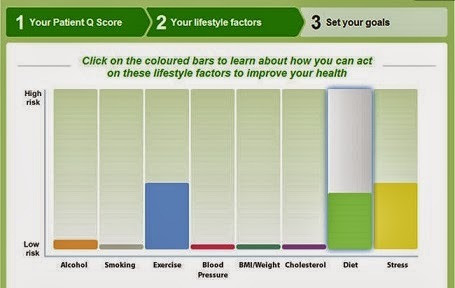 The further towards the green area you are placed, the healthier you are deemed to be. If you end up with a score of between 0-20, you’ll be placed well and truly in the red zone meaning your health is at risk. Between 20-60 and you’re in the Transformation zone, which you really want to try and get out of by making improvements to your health and lifestyle. A score of between 60-90 gives you a healthy ranking which is pretty good but there is room for improvement. If you land in the hallowed dark green area between 90-100, well, what can I say? You’re obviously doing everything right. You are in optimum health! So where was I? Looking at the arrow above, I am placed at number 79 in the queue of 100 people. I have to say I was a bit surprised at this, considering I lead what I thought was a healthy lifestyle. Yet still, I’m another 11 people away from the optimum area. I guess there's always room for improvement! To find out where you scored well and not so well, you are invited to click on the red button again to see your lifestyle factors. Here you are provided with a pretty bar graph, with a separate bar for the main areas: alcohol, smoking, exercise, blood pressure, BMI/Weight, Cholesterol, Diet and Stress. They’re rated on a scale ranging from low risk (small bar) to high risk (taller bar). This allows you to instantly see which areas of your lifestyle could do with some improvement. Looking at my chart, it’s clear to see which areas need improvement. Exercise, diet and stress. Surprisingly, Alcohol isn’t at the lowest risk for me despite me being a teetotaller. To find out why you didn’t score well in some areas, click on any of the bars to reveal a drop down page full of helpful information. A good diet is essential for good health. A healthy and varied diet will help to maintain a healthy body weight, enhance general well being and reduce the risk of a range of serious diseases including heart disease, stroke, cancer, diabetes and osteoporosis. The two keys to a healthy diet and keeping your weight in check are eating the right amount of food for how active you are and eating a range of foods to make sure you're getting a balanced diet. From the information you provided, your overall diet would appear to be fairly healthy and balanced. After this I’m told I score particularly well in Carbohydrates and Fibre, and fairly well in Fats, Salt and Caffeine. However I didn’t score well in Water and Eating Patterns. I am aware that I don’t drink much water, which I know I should do, so I guess I’ll have to get drinking. My eating patterns are a bit haphazard so I’ll have to try and improve there. For any areas you need to improve on, you can set your personal goals – see the graphic below. For each area, you choose what you think you can achieve (i.e. exercise – 3 sessions per week) and over what timescale. Choices are 1 week, 1 month, 2, 4 or 6 months or 1 year. You can tick or untick any of the 12 week programmes shown within the ‘Set your 1 week health programme'. For each programme you tick, you’ll receive a specialised weekly email over the next three months. These are full of practical health tips and information that are aimed to help you achieve your health goals. These emails will also contain links to more information and guidance on myhealth.patient.co.uk that will help to keep you motivated along the way. 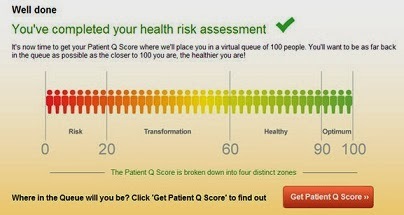 Once you’ve set your new health goals and you’ll be given your new target Q score. In my case, my new Q score went up to 87. Not quite 90, but hopefully that target should be achievable once I’ve managed to reach my new goals. Why not try out the tool for yourself to see where you are the queue? MyPatient.co.uk have won numerous awards including a Commended Resource Awards in the BMA (British Medical Association) Patient Information Awards in July 2013 and in January 2013 were recommended by The Times newspaper as a 'Top health website you can't live without'. 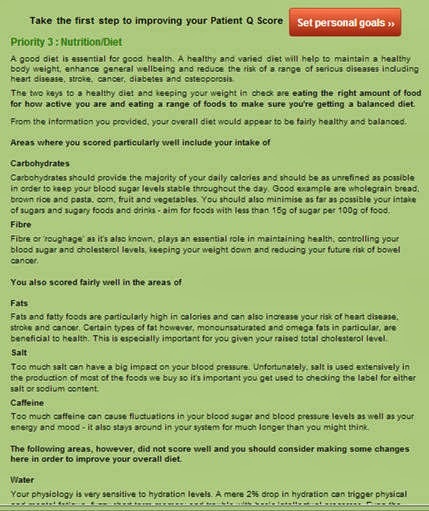 There is a wealth of health information on the site and I’m so glad to have found mypatient.co.uk. The myhealth tool really is the next best thing to having your own personal motivational health and lifestyle coach. And it’s all FREE! Why don’t you try out the tool for yourself. See how close you can get to the Optimum Health area of 90! Please note I am not being paid to write this review.